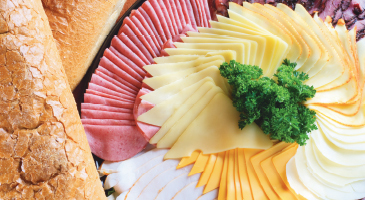 An assortment of Deli Meats and Cheeses. Accompanied by an assortment of our Breads $99. Substitute Croissant for 99¢ per person. Substitute Gluten Free bread $2. Your choice of tuna, egg salad, chicken salad and chicken liver on rye, whole wheat, and challah with lettuce and tomatoes. Accompanied with pickles, homemade chips and condiments. Substitute a croissant for 99¢, Gluten free bread $2, or pretzel roll for $1.49. Assortment of our quartered meat and cheese sandwiches on rye, whole wheat and challah bread with lettuce and tomatoes. Accompanied with pickles, homemade chips, and condiments. Substitute gluten free bread $2. Raisins, Mini Pretzels, Dark Chocolate Chips $2.69 per person. For a light group snack. An assortment of Bagels with Jam and Whipped Cream Cheese. $27.99, Substitute Gluten Free bread $2. A bountiful platter of Smoked Lox. Served with Sliced Tomato, Purple Onion, Capers, Lemons, and Fresh Bagels. Substitute Gluten Free bread $2. A tantalizing assortment of our meat and cheese on a healthy whole wheat or spinach wrap with lettuce and tomato. Accompanied with chips, pickles, and condiments.